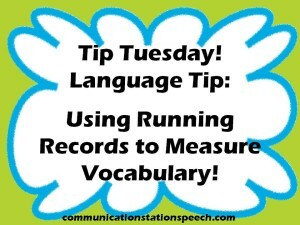 Tip Tuesday: Using Running Records to measure Vocabulary! 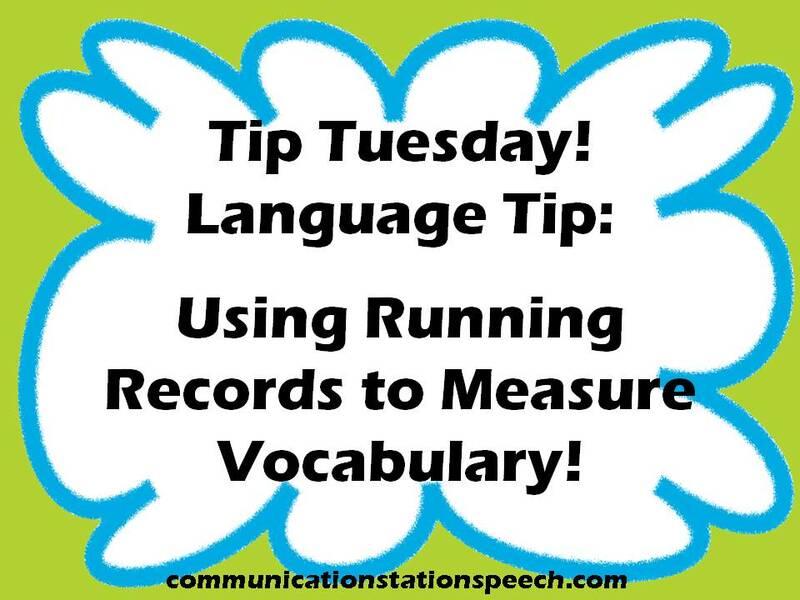 When working with very young children (below 5 years of age), who are primarily non-verbal, I find it helpful to use a running record to measure vocabulary. This is probably the most basic way to measure current vocabulary skills as well as monitor increases in vocabulary over time. One of the main reasons I like to use running records rather than periodic data for young children is that many times children will fluctuate drastically from therapy session to therapy session. One week, they may show me a number of works they understand or use and the next week they may not be interested, or may feel tired, or hungry, etc. and may not show me all they know. So I use running records to capture the moments these toddlers let me see just how much language they know! During the evaluation, I keep a running records of the words I heard my clients use. I will also have parents fill out checklists and parent questionnaires (one of my favorites is the parent questionnaire from the Infant-Rossetti Toddler Language Scale, although I also like to use the MacArther-Bates Communicative Development Inventories at times) in which they will indicate from a list of given words which of those common first words their child understands and then which they have actually heard their child verbally express. Looking at the running record and the parent information it becomes very clear to me the types of vocabulary words the child typically uses vs. understands. I am looking for a pattern of categories of words, if there is one, and often times there is, that the child seems to use or understand more so than other categories of words (such as family member names, common toys, clothing items, foods, transportation, pre-academic vocabulary (shapes, letters, numbers,), etc.). I am also looking for the grammatical types of words. Does the child mostly use or understand nouns/verbs/adjectives/etc.? By the time I’m done analyzing this information, I will know an approximate number of expressive vocabulary words vs. receptive vocabulary words. I will place these words on my running record sheets and they will be come my baseline. I like to streamline my paperwork as much as possible, so I simply use the same type of running record sheets to add new words as my clients begin to demonstrate the use or understanding of new words. This of course indicates improvements in overall vocabulary skills. And over time I can compare the baseline vocabulary running record to the additionally learned vocabulary words in order to demonstrate to parents the overall growth of the child. I will admit that then a child demonstrates higher receptive vocabulary skills during evaluation, I tend to write goals only targeting expressive vocabulary skills as that is the current need. However, it is possible there will be times, these young clients demonstrate delays in both areas of vocabulary therefore both must be targeted and running records for both must be completed in order to monitor effectively. In this manner, it is nice to demonstrate receptive vocabulary increases to parents based on running records even when expressive vocabulary does not seem to be developing as quickly. This way parents can see their child is still making progress and speech therapy services are working. 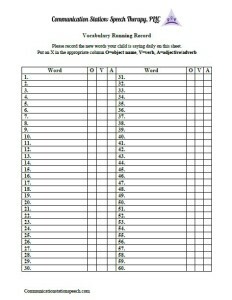 Here is an example of the simple running record vocabulary sheet I use. I made it as a word document and depending on if it is the baseline, receptive or expressive vocabulary skills, I will just write it at the top of the sheet along with the client’s name, in big letters so I don’t get them confused when using them in real time to record child’s progress. The other thing you could do is use two different colored papers, one color for the baseline and one for progress monitoring. This way you can visually distinguish between the two very quickly. I like to save paper so I tend to print this page on the front and back of the paper. If you want to use this form for your own use come back to my Freebie Friday post this Friday and I will have a link to this freebie for you. Then, I simply compare how many and why types of words the child is currently using (receptively or expressively depending on goals) vs. their baseline at specified intervals based on the language goals written and agreed upon with parents and note the progress! That’s it! It’s a easy and 1, 2, 3! Don’t forget to come back on Friday if you are looking for a free copy of this running record form! Do you use a different strategy to record vocabulary? If so, please share below! ← Freebie Friday: CVC2 Word Family Reading Strips!